One can hope that the various diversity issues plaguing the 88th Academy Awards, set for Feb. 28 at the Dolby Theatre in Hollywood, will not obscure the real reason we tune into the famed event: to celebrate great cinema. If this were 2005, I wouldn’t mind this controversy. There were horrible movies made in 2005 (anyone remember how they butchered “Bewitched?”). We could have done with a racism controversy then. But, as usual, Hollywood completely failed in their timing. So, poor host Chris Rock has had to rewrite his entire speech, which will supposedly address this circus. I don’t know why Will Smith wasn’t nominated, but the Oscars should not be dominated by Ivy League-style classroom discussions at the expense of 2015’s fantastic movies. And, frankly, for the first instance in my lifetime, Hollywood really did produce a lot of great movies. My intention in the remaining text is to highlight five of the films nominated for best picture: “Steve Jobs,” “The Big Short,” “Spotlight,” “The Martian,” and “Bridge of Spies.” I’m aware of the existence of those other films nominated for best picture. They’re probably very good, but I haven’t seen them. Based on Walter Isaacson’s iconic biography, Danny Boyle’s Steve Jobs contains Aaron Sorkin’s (“The Social Network,” “The West Wing”) screenplay with Michael Fassbender in the title role along with Cate Blanchett and Jeff Daniels. It’s Sorkin’s best screenplay. Like any good biography, the film is selective: it only deals with Jobs’ early to mid-career. While the film tries to assume that assertiveness is automatically bad, the portrait of Jobs is a nuanced one. Jobs, a businessman properly portrayed as an artist, has to contend with a former lover who claims her daughter, Lisa, is also his. While Jobs can’t seem to assume the kind of personal responsibility for family life in balance with his all-consuming work, the mother in turn is criticized for her own entitlement mentality. The rousing finish features an awakened Jobs celebrating the release of a new product at a press conference, with his proud daughter looking on from backstage. The finish celebrates a man-made even more heroic by the inner complications he was forced to overcome. Intelligent without being snarky, emotional without being fake, Sorkin did well. The Big Short was directed by Adam McKay and stars Christian Bale, Steve Carrell, Ryan Gosling and Brad Pitt as loners who betted against the housing market before the bubble burst in 2008. Smart, irreverent, and predictably liberal, even finance gurus will have to pay attention to keep up. While it ignores the government’s subsidizing of the housing market, the film must be praised for condemning stupidity in a mad world–and hinting at something better that could be possible. Based on a major ongoing scandal, Spotlight is my darkest choice. It follows the courageous efforts of investigative Boston Globe reporters to expose child molestation by Catholic priests. Starring Mark Ruffalo and Michael Keaton, it’s the best glorification of journalism since “All the President’s Men” (possibly even trumping that). Tom McCarthy and Josh Singer’s screenplay delivers; the raw, pointed storytelling details the importance of knowledge over faith, the loss of innocence and moral idealism, and that “it takes an outsider” to make a difference. It’s a heroic film. Based on Andy Weir’s novel of the same name, Ridley Scott’s (“Alien”) The Martian starring Matt Damon is pure can-do fun! Emotionally fulfilling, it follows the efforts of stranded astronaut Mark Whatney to survive on Mars, and ultimately get back to Earth. It details the importance of resilience, independence, and humor in the face of struggle. 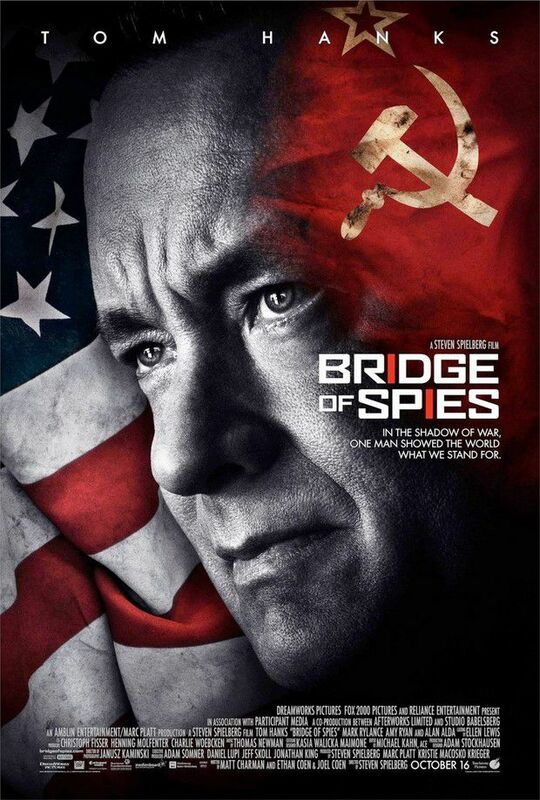 Steven Spielberg’s Bridge of Spies might be the best of the five. Also based on true events, Tom Hanks plays a lawyer, James Donovan, who defends an accused communist spy, Rudolph Abel–Mark Rylance in a moving performance–at the height of anti-communist Cold War hysteria. Boasting a masterful screenplay with Matt Charman, and Joel and Ethan Coen and a haunting Thomas Newman score, the film’s illustrates the relationship between two different civilizations, American and Soviet Russia, even though the film is historical only in so far as it needs to contextualize the portrayal of ideas, and how a free society gains the upper hand against enemies of the free world. Ultimately, the superiority of freedom is sanctified, but neither the U.S. government nor the Soviets are portrayed as winners: they are two sides of the same coin. Its Donovan and the Abel who are the winners–products of the same spirit of mankind, if victim to two opposing world views. Any one of these films deserve the Oscar for best picture, so I’m rooting for all of them. In an age when an American sense of life should be defended, these films do a better job of expressing that vision than any one of this year’s political candidates. If there’s a bias problem in the Academy, then fix it. But never forget about this: it’s about the movies.